Up to 300 homes in Colfax are damaged by major flooding. The Skunk River has already topped the previous record crest set in 1993 in the Jasper County town and could rise a few more inches before receding. Kevin and Beth Lewis’ home is surrounded by flood waters. They escaped shortly before four o’clock this morning after a levee breach inundated the west side of town. “It was just no use. Our pumps couldn’t keep up with it and it just took over,” Beth Lewis said of the water. 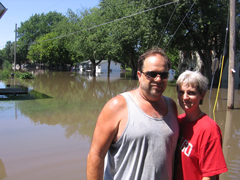 Kevin and Beth Lewis with their flooded home in the background in Colfax. The couple and their three teenage children have lost nearly everything in their basement – which is completely full of water. Kevin Lewis offered a partial list to a reporter: “The washer, dryer, everything in the TV room (and) the game room — the pool table, hockey table.” Beth Lewis lamented the loss of “sentimental things” in their home. Two of the four roads leading in and out of Colfax are closed – including the Highway 117 connection with Interstate 80.